Insurance is sometimes seen as a costly burden for charities. In tough economic conditions, many organisations are facing funding cuts and some might be reducing their cover, or disposing of it altogether, as part of a desperate attempt to slash costs. However, charity insurance claims are more common than many people think and, without the right cover in place, charities could be left exposed to costly payouts. According to the Charity Insurance Report 2012 by Third Sector Research, more than one in five charities claimed on their insurance in the previous year. The value of each claim depends on the circumstances, but they can easily run into thousands of pounds. The most common claim (42.7 per cent) was for damage to buildings. An incident such as a burst pipe can be devastating for a charity, but the cost of the loss stretches far beyond physical damage to the building. Of course, the cost of replacing the building’s contents and repairing the interior would be substantial, but the disruption to the charity’s operations can put enormous pressure on a charity’s finances. An organisation is likely to need to rent alternative premises while repairs are made to its building, leading to yet more costs, and income could be lost through missed opportunities. 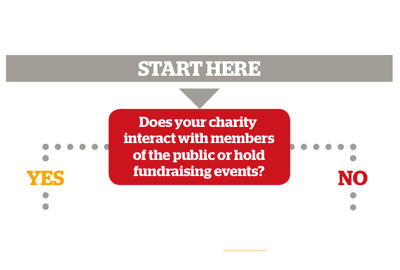 Legal liability is another area of concern for charities. According to the Charity Insurance Report 2012, 24 per cent of respondents said they considered this their biggest insurance risk. Our litigious society puts even charities at risk of being sued if they make innocent mistakes, and the legal costs just to defend the claim can be significant. There is, however, insurance that can cover the legal costs of defending the claim and damages that might be payable. Public liability insurance can protect against injury to third parties, such as a participant tripping over a cable during a fundraising event in a village hall. Trustee indemnity insurance can protect against allegations of wrongdoing by a trustee, and professional indemnity insurance can protect against allegations of negligent advice – for example, when a service user has been poorly advised. Such incidents usually can’t be foreseen but, with comprehensive cover in place, the financial effects on the charity can be minimised. It can be difficult to appreciate all the different types of cover and the scenarios they protect against. 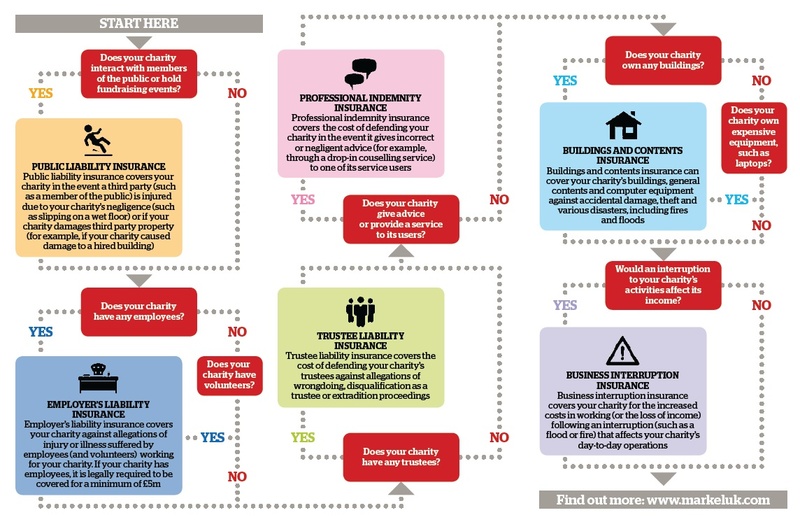 Markel has produced the charity insurance decision tree to help charities understand the risks they face and the covers they might need to consider. Download the decision tree here. Commissioning and procurement: what are the risks?